Madge wrote: All of a sudden, it seemed that a healing light filled the area; the more literary minded amongst them thought they caught a few lines of a John Donne poem. However, whatever magic was in the healing light, it seemed as though Sabrar had been dead too long for it to matter. I have a reason to not claim my role name right now, but this was the result of my night 1 action. Please answer me this SirGabriel, why do you believe there is definitely a Mafia? Also, do you believe there to be a Serial Killer still alive? If so, why do you believe your presumed Mafia member is more dangerous than the Serial Killer? If not, how do you explain the odd vote change at the end of D1? I use logic both as scum and town. See for example this post in Pen Pals for an example where I did so as town. Where possible, I try to use logic, although not every game makes it possible to do so due to the amount of public information. @mpolo, does what matt said make sense to you, and if so, does that convince you that matt is your submitted role (and therefore town)? jimbobmacdoodle wrote: Please answer me this SirGabriel, why do you believe there is definitely a Mafia? Also, do you believe there to be a Serial Killer still alive? If so, why do you believe your presumed Mafia member is more dangerous than the Serial Killer? If not, how do you explain the odd vote change at the end of D1? Because I'm not immune to SK kills, only mafia kills. The lack of kills suggests that there's only one killing power in the game. Simple: matt's role isn't in the game. Madge created a different role which has the power to alter votes. Thank you, that makes sense to me. Another question: do you think there is only one mafia? I'm pretty sure that a two mafia team is possible, especially if matt's submission is not in the game (see my logic above). jimbobmacdoodle wrote: Another question: do you think there is only one mafia? I'm pretty sure that a two mafia team is possible, especially if matt's submission is not in the game (see my logic above). We have two third party roles dead. Assuming matt's role was replaced with mine, which I believe to be the case, that's three known third parties. That leaves five unknown, so mathematically, yes, there could be two mafia without breaking the at-least-as-many-town-as-mafia rule. However, since I know Lawrencelot is telling the truth, the only mafia team I can think of that's consistent with the claims is me and you, and we both know that we're not a mafia team. So I'm ruling out that possibility. Actually, it appears that mpolo has not yet confirmed matt's role, which means a jimbob-matt mafia team is still possible. SirGabriel wrote: ...matt's role isn't in the game. Madge created a different role which has the power to alter votes. Are you claiming to have a vote manipulation power? If not, you are being inconsistent in your logic. (I'm assuming in the second statement you are saying that your role is a replacement for matt's submitted role - if not, please clarify). You cannot have Madge's made up role and not have the vote manipulation power if you believe vote manipulation was made up by Madge. Jimbob is currently my first choice. With a vote buy possibly around, putting him at two votes could be L-1, though. mpolo wrote: Jimbob is currently my first choice. With a vote buy possibly around, putting him at two votes could be L-1, though. Care to explain why? Also, you didn't claim who you roleblocked last night still. I think it's worth baring in mind that SirG is self-claimed third-party, with as little evidence to support him as my role. Furthermore, even if he is who he says he is, he has not claimed a victory condition and we have no reason to believe that he has town's best interests at heart. Ergo, his claims need to be taken with as much, if not more, suspicion than mine. Furthermore, he claimed that somebody else needed to target him to gain their power. We have seen no indiciation of this. My theory is that we do have the second SK as claimed, and that they didn't get their kill power until they targeted SirGabriel. What SirG's win condition is, I cannot say. Assume moody is the SK. If moody is the SK, mpolo is lying about receiving the gun (because moody would not have that ability). So mpolo would have to be the lover of moody the SK. Assume mpolo is the SK. That means Lawrencelot is lying about mpolo's role and is his lover. Assume Lawrencelot is the SK. That means mpolo must be the team-mate, as otherwise Lawrencelot could not know mpolo's role and mpolo could have contradicted the result. Assume matt is SK. Mpolo must be matt's lover, because otherwise he is lying about knowing the role matt has. However, note that matt's ability has been publicly demonstrated to exist, and nobody else has claimed it, so this case is unlikely. Assume SirGabriel is the SK. Either he didn't (or couldn't) use an action N1, something caused it to fail, or I am his lover. Assume I am the SK. Somebody is my lover, and I don't think there's any way of limiting this down. That means that of the six remaining players, only one SK/lover team is possible that does not involve mpolo - me and SirG. From my point of view, and it should be from SirG's, lynching mpolo takes out the SK, whoever it is. If anybody sees any logic failures there, please clearly indicate them. The only questions in everybody else's minds should be whether a) there is a second serial killer and b) whether SirG and I are the SK/lover pair. I think it should be clear from SirG's vote on me that the latter cannot be the case. As noted by another player (can't remember who), if there is one, the SK with vote buy and lover support is a 3 vote block with a kill and controls the vote after one more death. Assuming there is no more than 1 mafia member, then any potential mafia cop is only a 1 vote block with a kill, so dealing with the SK is a priority. If the game continues, then we should look for the mafia (I know that the mafia would say this as well, but I hope everybody else sees the logic either way). Are you claiming to have a vote manipulation power? jimbobmacdoodle wrote: I think it's worth baring in mind that SirG is self-claimed third-party, with as little evidence to support him as my role. Furthermore, even if he is who he says he is, he has not claimed a victory condition and we have no reason to believe that he has town's best interests at heart. Ergo, his claims need to be taken with as much, if not more, suspicion than mine. Furthermore, he claimed that somebody else needed to target him to gain their power. We have seen no indiciation of this. My theory is that we do have the second SK as claimed, and that they didn't get their kill power until they targeted SirGabriel. What SirG's win condition is, I cannot say. Nobody gained a kill power by targeting me. After all, how would that make sense given my claim? I think it's pretty clear that I didn't expect the person to whom I was speaking to know that my role existed (I would have been more subtle if I believed they knew my role existed), which rules out a serial killer who can't kill (which, by the way, makes no sense as a role in the first place). And there is no typical secondary ability to serial killers with which they could target me, which again contradicts my claim. I will say that my win condition now is slightly different than it was before. jimbobmacdoodle wrote: That means that of the six remaining players, only one SK/lover team is possible that does not involve mpolo - me and SirG. From my point of view, and it should be from SirG's, lynching mpolo takes out the SK, whoever it is. If anybody sees any logic failures there, please clearly indicate them. The only questions in everybody else's minds should be whether a) there is a second serial killer and b) whether SirG and I are the SK/lover pair. I think it should be clear from SirG's vote on me that the latter cannot be the case. Except there is no serial killer in the game (well, not anymore, since we killed Sabrar). What kind of role would make sense as a serial killer's lover? Obviously not town, since they would have sacrificed themselves by now in order to kill the SK. Nor any other role anyone has claimed to submit (unless we had a pair of serial killers who were basically a mafia team with two kills and no chat, but since the Witch Doctor is dead, we can rule that out). Madge could have submitted a role that would make sense there, but if she did, then where did my role come from? I can't prove it, by I am positive there are no living serial killers in this game, which means I'm looking for the mafia, and I think the mafia is jimbob. Where is everybody? Almost all the D3 content so far has been from myself and jimbob. Busy weekend. I am reading but need some time to process everything, and I have less than 1 minute now. Posting more tomorrow, but only in the evening. I can answer short and easy questions probably. The morning is going to be busy, hopefully in the afternoon, I can post more. I blocked SirGabriel last night. The reason I didn't come to the immediate conclusion of him being mafia/serial killer/something nasty is that there was also no evidence of matt's power being used in the flavor — on day two we heard about the "healing power", and I would have expected some sort of hint as to what power he used on the current day. And there is a vote-buying role-blocker, whom matt identifies as scum from his submission. Will post more later, but I don't think I mentioned that my result would have been messed up even if the attempted killer was roleblocked, so mpolo blocking scum!SirGabriel is certainly possible with what I know. One case I think needs mentioning to add to mpolo's is that SirGabriel could be a roleblocker who blocked matt whilst being blocked. This would likely be the other serial killer. I'd like to hear from Matt whether he used his power last night, as well. Not sure how I could narrow that any, though. We've already had one SK die (Sabrar), so having a second SK out there would, IMO, round off the killing roles well. Perhaps the second SK is technically a one-person mafia vis a vis SirG's claim about who can kill him. I did use a power that would have been reflected in the opening post today, but something happened, as there was no reveal of the information that would have been recieved. Warning, I typed this post out pretty steam of consciousness, so there is a lot in it, and I haven't really rewritten it at all since. Sabrar - Submitted jester (verified by heuristically_alone flip). Flipped Witch Doctor. heuristically_alone - Submitted Mafia Cop (according to Lawrencelot). Flipped Jester. Lawrencelot - Submitted and kept (claimed Town) Researcher (confirmed by knowing mpolo's role*). mpolo - Submitted Town healing aura role (verified by matt's claim). Claimed Town Roleblocker (verified by Lawrencelot). moody - Submitted and received Gunsmith (verified by mpolo receiving a gun**). matt - Submitted vote buyer/rolebocker/lover SK (unverified). Claimed healing aura role (verified by mpolo). jimbobmacdoodle - Submitted and received bulletproof tracker, of sorts (unverified). SirGabriel - Submitted Witch Doctor role (verified by Sabrar flip). Received third party role with vote buy and bulletproof to Mafia kill (unverified). * We do not know that Lawrencelot is Town, nor do we even know he is a researcher. He could be a Mafia rolecop or similar, who made up his result and just got the mpolo's alignment. He could also be a Mafia Researcher. ** Moody's alignment is unknown. He could be a Mafia gunsmith for example. Both moody and Lawrencelot received their own roles, apparently, which means we have no way based on player submissions to know whether they are telling the truth. Obviously, the same goes for me, but I thought it worth pointing out that we cannot treat them as confirmed Town, even if we assume that there is only one scum. Either of them make sense as lone Mafia (they could of course have a team-mate) whose kill has failed both nights - N1 either because they targeted SirGabriel, or were roleblocked in moody's case, N2 because they targeted me. I don't think the same can be said for either mpolo or matt, assuming that they aren't part of a team with at least one other mafia member. Of the claims above, none of them particularly make sense to me in conjunction with this. The implication of his wording is that it's a fairly normal sort of role. It apparently has two aspects to it, at least one of which is a targeted ability. This clearly rules out both Sabrar and heuristically_alone's roles, which means (assuming SirG is being truthful) that he is in some way working with another player (possibly the other player does not know it). Also, his reluctance to explain more about it, and the fact that no player has claimed to have gained additional powers by targeting him suggests that he has a non-town partner (nobody seems to have suggested that they thought they were missing part of their power, nor do I see any obvious cases where they are missing a part based on the claims). 3) mpolo's ability is straightforward and has only one aspect (assuming town aligned, doesn't look like he's missing any other). 4) moody's gunsmith usually only has one aspect (assuming town aligned). 5) matt's ability sounds unusual to me, mostly because of the public aspect to it, I can't really comment on it further, but if mpolo or matt want to shed some light on whether this could make sense, please do so. I'm not really sure where this is getting me, to be honest. One thing I'm fairly confident of is that SirG is not a lone Mafia member, nor a Serial Killer, unless he withheld a kill N1, which seems unlikely. He could be part of a Mafia team with moody, which would explain the lack of kills on both nights (moody was blocked N1, SirG N2). SirG seems convinced that there is no SK in the game any more. Part of his argument is that no role would make sense as a lover with the SK. However, I could see Madge changing a player's submitted win condition to work as a kind of SK team-mate (especially as they haven't outed themselves yet). I disagree with SirG's conclusion. However, I cannot see a way that an SK exists unless they either withheld their kill on N1 and/or SirG is lying. @Matt - do you know what would happen if your SK's lover was Town and therefore would have an incompatible win condition with the SK? If his win condition is tied to that of an anti-town player, he is almost as dangerous as said anti-town player, assuming he has the vote buy as claimed. Further, lynching him is not going to lose Town anything, apart from the ability to lynch somebody else. His flip might also give us a clearer indication of what is going on, even if he isn't the SK or a mafia member - e.g. does he actually have the vote buy? On the vote buy (assuming he has it as claimed), he used it D1 to vote for Sabrar, whilst his own vote was for moody. I have two possible theories relating to this: either he was trying to hide the fact that he had a vote buy at that point, but gave up when I pointed out the potential inconsistent claim, and/or he is in league with moody, bussed him a little, but knew he could probably save him with a late vote buy. Ninja'ed by matt. Further thoughts and vote to follow. Oh wow, sorry guys, that last post was even longer than I realised! @Matt - in case you missed it in my massive wall o'text, there's a question there for you, in the middle, underlined. matt96 wrote: I did use a power that would have been reflected in the opening post today, but something happened, as there was no reveal of the information that would have been recieved. jimbobmacdoodle wrote: One case I think needs mentioning to add to mpolo's is that SirGabriel could be a roleblocker who blocked matt whilst being blocked. This would likely be the other serial killer. Assuming matt is not lying, we are in this case here, FMPOV. I think this reinforces my vote. By the way, I realised that it is also possible for mpolo to be in league with an SK (or possibly be the SK, with Lawrencelot's support) for it to make sense that matt was roleblocked - there is no proof that mpolo roleblocked SirG, given that I absorbed whatever kill was thrown at me. However, that would make the whole vote buy issue really confusing. So if a Town player was a lover, and assuming they knew they were a lover, they should admit to it and take the hit for the greater good, because they still win with town then? Of course, third party roles are not really affected by this and may or may not have a reason to claim. That was the idea anyways, submit a strong role that if I did not get it would be easily neutralized by the knowledge that it existed. In response to uncertainty on how to digest that large post above, Sabrar in Gojoe has suggested I post a summary of the key points. If anybody would like me to in the next hour or two, please let me know. Unrelatedly, assuming I don't get targeted by a night kill or roleblocked (and I don't get lynched), it's worth pointing out that I should be able to prove I am a tracker based on tonight's results, by tracking moody. He gives the gun to someone, I claim who, moody and/or his target confirms. This should even work if one of them is killed or moody is roleblocked (though it is less reliable). Obviously, I cannot prove that I am Town from this. Sorry guys I still haven't found the time to get my thoughts together and focus on this game. I hope tomorrow will be better, depending on work and other real life issues. And as I said in my previous post, it might help me out if I get some direct questions. I have been reading. Lawrencelot wrote: Sorry guys I still haven't found the time to get my thoughts together and focus on this game. I hope tomorrow will be better, depending on work and other real life issues. And as I said in my previous post, it might help me out if I get some direct questions. I have been reading. 1) Which of matt's submitted SK and heuristically_alone's submitted roles do you believe to be in the game, and why? 2) What are your thoughts on the possibility that moody is not town? 3) Have you got a strong feeling as to who is scum, and why? If anybody's got any urgent questions to ask me, I will try to check in again one last time in about 20-30 minutes. The question I would like to ask, probably too late considering time zones, is: Why did mpolo wait until D3 to reveal that he had roleblocked me? Impromptu Mafia - Night 3 - Expelled! Day 3 is over with a tie between two players. The lynch was a tie between SirGabriel and Jimbob. 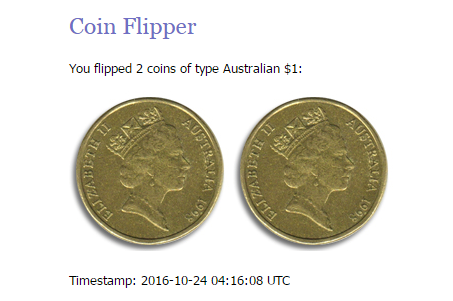 I am using random.org's coin flipper. Heads means lynch; tails means no-lynch. SirG gets the first coin and Jim gets the second (because of their appearance in the votals). The pupils were fighting; accusing each other of all sorts of unspeakable acts. Fortunately, they sparred only with words until SirGabriel grabbed Jimbob and gave him a wedgie. Jimbob's vision grew cloudy; he flailed and ripped at SirGabriel's hair, grabbing a big chunk of it. The onlookers cheered, for this was as exciting as their Staffordshire high school ever got. "SirGabriel! JimbobMacDoodle! I have warned you a thousand times, I am going to call your parents and have them take you home. You are EXPELLED from this school!" Day 4 will begin in at most 25 hours. Get your night actions in! Re: Impromptu Mafia - Night 3 - Expelled! The year was 1973. Miguel Ángel Brindisi was on fire this year, helping bring Huracán to the final match against the Boca Juniors for the Campeonato Metropolitano, the one of the premiere Argentine football tournaments. He had the ball and raced towards the opposing goal; however, Mateo the estóper and Modesto the arquero were both ready to defend. He couldn't have that. Huracán had to win a title, and he would kill those two men if it came to it. Fortunately, he had supernatural skill with the ball; he ran towards Modesto, and, pulling his leg back, kicked with all his might. The ball sailed through the air and hit Modesto in the side of the head, striking him dead. Horrified, the rest of the players looked to Lorenzo, the referee. No red card was shown; the ref indicated that play should continue. Miguel ran to Modesto's corpse, where the soccer ball rested, and began his assault on Mateo and the goal he defended so bravely. Once more, he let loose a mighty kick. This one sent the ball flying with even more force than before, again, into Mateo's head. This time, the momentum knocked the head clear off, and it flew, stopped ultimately by the net as the corpse - now with a soccer ball for a head - fell limply to the floor. Lorenzo blew his whistle. "GOOOOOOOL!" He declared, running onto the field to embrace Miguel - or mpolo, as he called him in their private moments together. The couple let loose a passionate kiss, which was treated with boos from the crowd of thousands who had come to realise this referee was anything but impartial. "I knew you could win this game for us! Now we can escape on our gambling winnings and sail the Carribean together." Declared Lorenzo, looking adoringly into his darling's eyes. "Of course, my love. All the people who I dispatched with my famous goal kicks, every single one of them was for you. It's a pity our long-lost adopted son Gabriel could not live to join us." A tear welled up in Lorenzo's eye, as he nodded grimly. "Yes. It is. But come. We have some sailing to do..."
Moody was killed in the night. He was a town gunsmith. Lawrencelot has outlived all the players who received their own roles. He has won. Mpolo controls the vote for the skrull mafia. Mpolo and SirGabriel have won. Everyone else has lost - but thanks for playing! "You are a sleepwalking Deity. Each night, you will use one of the following powers. If you submit an action, you can choose which one will be used (should you forget, it will be chosen randomly). A) Starting on the next day, all players may freely PM other players during the day, provided they send a copy to the mod. B) Starting on the next day, the votes required for Lynch is one less than normal. C) Starting on the next day, the votes required for Lynch is one more than normal. D) Starting on the next day, two randomly chosen players become Lovers. E) The first letter of all role names will be revealed on the next day. G) All persons who died in the night tonight are resurrected. H) The mod will choose a random number x between 1 and the number of players. The xth player's vote is automatically lynch only on the next day. I) Starting on the next day, no player can change his vote. K) Starting on the next day, the mod will attempt to make all day start information cryptic." You win if at least one member of your group is alive and all other players are dead (or if nothing can prevent the same). You share a Private Topic with your fellow scum; mpolo. You have a factional night-kill meaning that each night one of you may night-kill a player." Bulletproof tracker, with a twist: if targeted by a kill, receive a single random result instead of the correct one(s). Once a night, you can choose a player and find out what role they submitted. You automatically survive two nightkill attempts in total. This protects against any ability that results in your death during a night (so also delayed killing, killing after being swapped, targeting a paranoid gun owner, etc.). You win if you survive and all the players who have the role they submitted (except for you possibly) are dead. Also SURPRISE: you're lovers with mpolo! Stingers: Your body builds up energy in your hands, enough for a nightly roleblock ability. You would be out of action as well if you were stung in the eyes. The Skrull Captain is a shape-shifter. You are pretending to be Wasp, so you still have all of her abilities (lover, roleblock, vote buy), but you also have a night kill as the leader of the SKRULL MAFIA. There is also a traitor somewhere, who is secretly aligned with you! They win with you. If you target them with your kill, they will join your side and gain night chat. But who could it be???? Madge wrote: As it was shabbat on this beautiful Qatari evening, SirGabriel stayed at home all night engaged in quiet rest and reflection. Madge wrote: They lived in adjacent small, comely hamlets in the French Empire's department of Ourthe. Little did they know, they were twins, separated at birth! Twins who shared a xenophobic rage against their German neighbours. One day, mpolo had gone out with his knife to stab the unwary SirGabriel, believing from his attire that he was German. When he turned the head to slash at the throat, his preferred method of execution, instead he saw SirGabriel's face - identical to his own - and mpolo's mouth fell open in shock. "You must be my twin brother; we were separated at birth, and I've been looking for you. Now, let's go kill some Germans for the glory of the French empire!" Congratulations! The mafia has found their traitor. You have daychat (please include the mod in all PMs). You also now share control of the nightkill. If you disagree, I will flip a coin to determine whose wishes are followed. The person who submits the "Kill: NAME" action in bold will be considered to have carried out the kill for purposes of investigative roles. Madge wrote: You hop on your bicycle and fly down the Belgian countryside at top speed, until you arrive at heuristically_alone's house when they are not home. You sneak in, grab the recently used pad of paper, and gently rub the flat side of a lead pencil along it to read the last message written from the indentations. My chosen is mafia detective. Aligned with mafia. At night, they can investigate any player to know their alignment. Madge wrote: You travel to Jimbob's house in Saddleback Valley and manage to squeeze a small revolver - wrapped in a red bow - into his letterbox. Madge wrote: You sign a decree stating that nobody should die on this beautiful evening. Madge wrote: You sit in the stands of the stadium in Sydney, watching the preparations for the Paralympic Judo competition. You notice one of the athletes from the United Arab Emirates prepare for his event, doing stretches and talking with his coach to get psyched up. However, you realise that his opponent is the legendary Sergio Arturo Perez, considered an easy favourite in the under 60kg division. It occurs to you that he must be extremely naive to think he has a chance against such a perfect athletic specimen. Madge wrote: The two brothers hopped into Jakob, the new Swedish car, and began to sow terror onto the countryside. First, they rampaged past Mats' house, grabbed him, and stuffed him into the boot of the car - they thought he could be up to something this evening. Then, to round out the night, they drove past Johannes' house and peppered the building full of bullets. Madge wrote: The next person you wish to visit with a little gift is mpolo, a lecturer at Illinois College, conveniently located on Route 104, Illinois. You manage to squeeze a small revolver - wrapped in a red bow - into his pigeonhole. Madge wrote: Carefully decorate the Awareness League headquarters, black and red flags everywhere, ready for your next rally in support of strikes in the Nigerian public service. You notice, amongst the pamphlets, a loaded revolver - containing a single bullet. Hey, perhaps this is just the thing you can use to further the anarchist cause? You have been given a one shot night kill in the form of a gun. Good game everyone, thank you Madge for running it! You didn't luck out, h_a. You played extremely well and should be proud! I should have gone with my first instinct and gone after mpolo yesterday for being the likeliest player involved in a scum alliance. In the unlikely event that had succeeded town might have pulled off a victory still. It was good fun despite the game seemingly not balanced. Well done all those with victories and thank you for modding, Madge. Now, off to play MMM2. Hey, if matt wasn't killed last night, he was set up to turn the game around for town by using his vote-modifying power to reduce the number of votes required to lynch and thus quickhammer one of mpolo or Lawrencelot which would make the whole house come crashing down. I really wish I could have seen it, it would have been an excellent twist. Good game everyone! You all made it very easy for me by claiming whether you had your own role or not D1, but heury's play throwed me off big time! I had to come up with an even more complex role to get myself out of that situation, but with so few town it didn't matter anyway. And thanks for modding Madge, this game was a lot of fun! Don't get too excited, you were playing right into my plan. The last game day I was trying to make myself look scummier than mpolo, and clearly it worked. But I am impressed with how much of the setup you guessed. You just didn't quite figure out what I hinted at D1: mafia normally has two powers, kill and chat, and targeting me with his kill gave him someone to chat with. Lawrencelot wrote: Good game everyone! You all made it very easy for me by claiming whether you had your own role or not D1, but heury's play throwed me off big time! I had to come up with an even more complex role to get myself out of that situation, but with so few town it didn't matter anyway. You certainly had me fooled. I was convinced that you were a townie and didn't know you were a lover. We considered just forcing a tie on Day 3, since town didn't have a majority, but the tie mechanism made that dangerous. If I had known that Lawrencelot was more interested in surviving than in the town, we actually could have controlled the vote absolutely on Day 3.